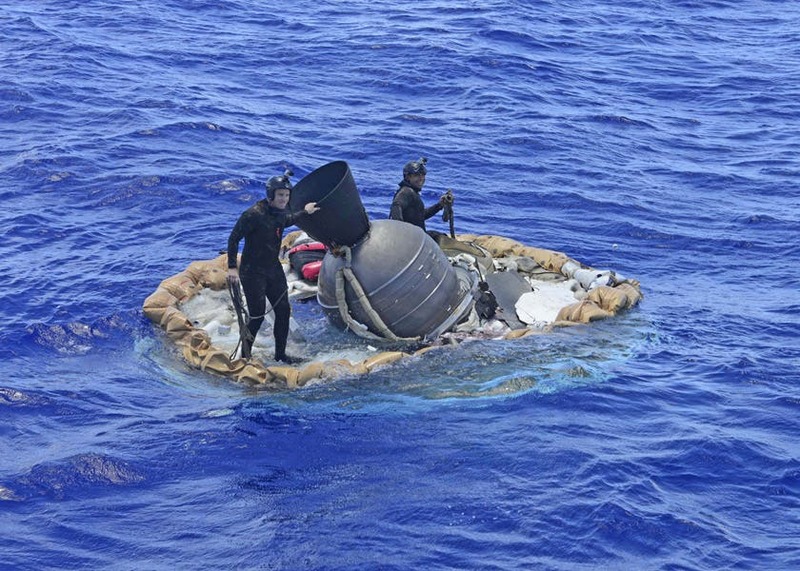 Two members of the U.S. Navy's Mobile Diving Salvage Unit (MDSU) 1 Explosive Ordnance Detachment work on recovering the test vehicle for NASA's Low-Density Supersonic Decelerator (LDSD) project. The saucer-shaped LDSD craft splashed down at 11:49 a.m. HST (2:49 PDT/5:49 p.m. EDT) Monday, June 8, 2015, in the Pacific Ocean off the west coast of the Kauai, Hawaii, after a four-hour experimental flight test that investigated new technologies for landing future robotic and human Mars missions. During the flight test, a Supersonic Inflatable Aerodynamic Decelerator (SIAD) and a supersonic parachute were deployed. The SIAD operated as expected, dramatically slowing the test vehicle's velocity. When the parachute was deployed into the supersonic slipstream, it appeared to blossom to full inflation prior to the emergence of a tear which then propagated and destroyed the parachute's canopy. As a result, the saucer's splashdown in the Pacific Ocean was hard, resulting in fracturing parts of the structure. Memory cards containing comprehensive test data — including high-speed, high-resolution imagery recorded during the flight — were successfully recovered. Also recovered were the test vehicle and its components, the supersonic parachute, the ballute used to deploy the parachute, and a large weather balloon that initially carried the saucer to an altitude of 120,000 feet. For more information on LDSD, visit http://www.nasa.gov/ldsd. NASA 'Flying Saucer' Launch Set for Today –"A Soft Mars Landing for Manned Exploration"